Holling Hoodhood is one of the most likeable male protagonists in the past 10 years. Gary D. Schmidt brought to life this 7th grade boy from 1967 who learns much about life and family. Plot: Holling Hoodhood is really in for it. The historical backdrop that includes Yankee Stadium, Vietnam, Political assassinations, and even Woolworth’s. What an enjoyable way to learn about these places and events through the eyes of our young protagonist. The use of Shakespeare’s works as they are woven into Holling’s year that brings much debate but also understanding to what he observes. The emotional honesty that the author brings forth. It left me satisfied as each plot point came to a satisfying conclusion. Though the time period is 46 years in the past, events of today could easily be substituted. It would make a fantastic read-aloud in the classroom or home. Favorite Line: To ask your big sister to be your ally is like asking Nova Scotia to go into battle with you. 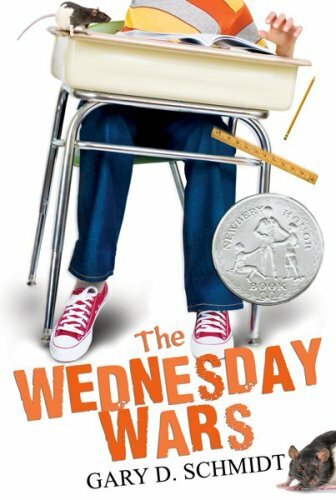 Who will love this book: Anyone who is 12 or wants to go inside the head of a 12 year old would enjoy THE WEDNESDAY WARS. It’s not a short read and borders closer to upper middle grade. The chapters are lengthy but contain perfect stopping points within. I couldn’t wait to get back to the story each day. 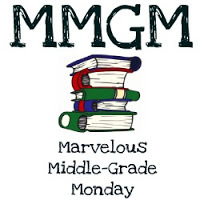 This entry was posted in Reviews and tagged Gary D. Schmidt, Marvelous Middle Grade Monday, Middle Grade Book Reviews, The Wednesday Wars. Bookmark the permalink. I loved this book, not just because I was approximately the same age as Holling in 1967! (Yes, I remember the 60s…) The voice is spot on and the writing is fantastic. In fact, one of the SCBWI workshops I attended this summer used examples from this book for how to show tension in a scene.